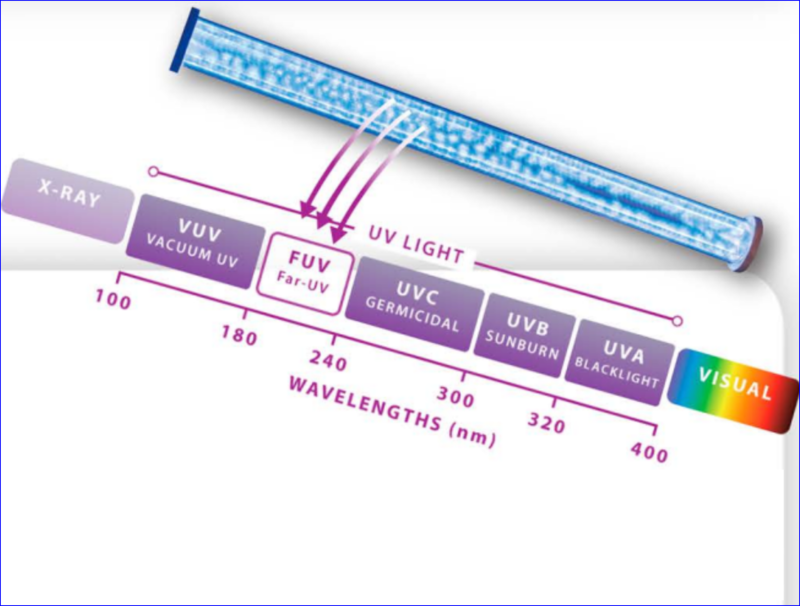 Far-UV Sterilray™ Technology is up to 1,000 times more effective than germicidal UV-C. The ASDU’s very high photon energy actually breaks and destroys the outer membrane and protein molecules of microorganisms, whereas UV-C only deactivates replication. 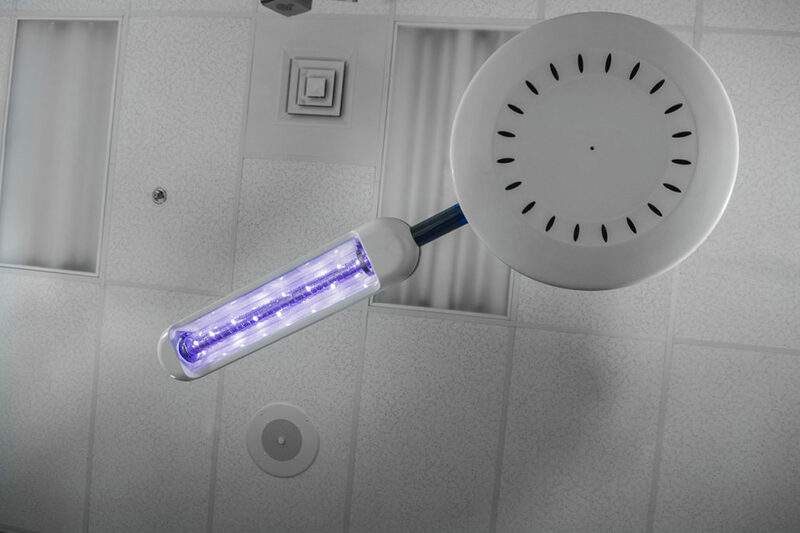 The quicker action time of Far-UV Sterilray™ makes single-pass kill possible in HVAC and surface disinfection. 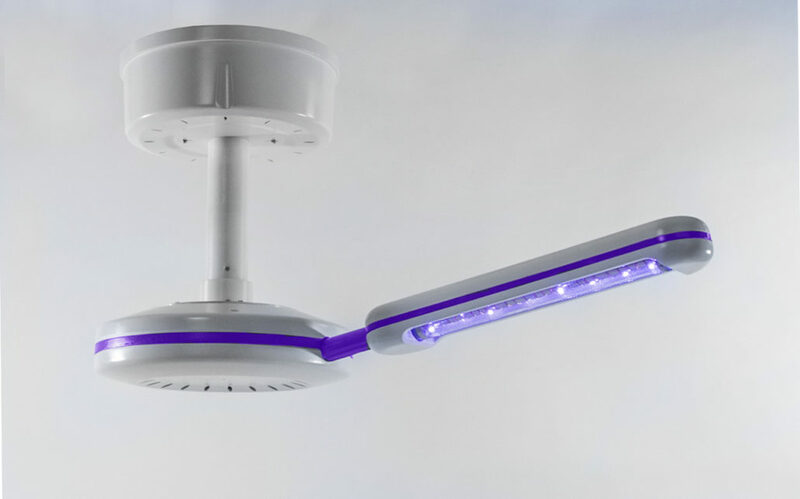 Rotating lamp and power supply reduce the need for multiple units. Instant off with motion detectors. No labor required; operation controlled by room switch (delay timer). 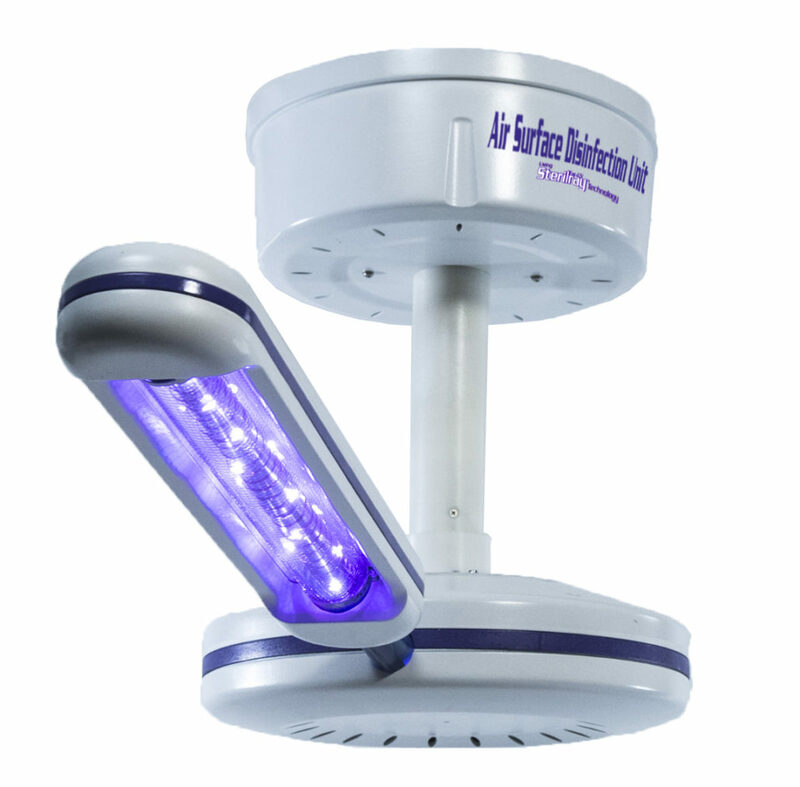 Produces high-level disinfection of room air and exposed surfaces. Destroys surface pathogens (MRSA, C.Difficile, VRE) that routinely compromise healthcare environment. Far-UV Sterilray™ produces up to 1000 times greater destruction than any other UV sources. 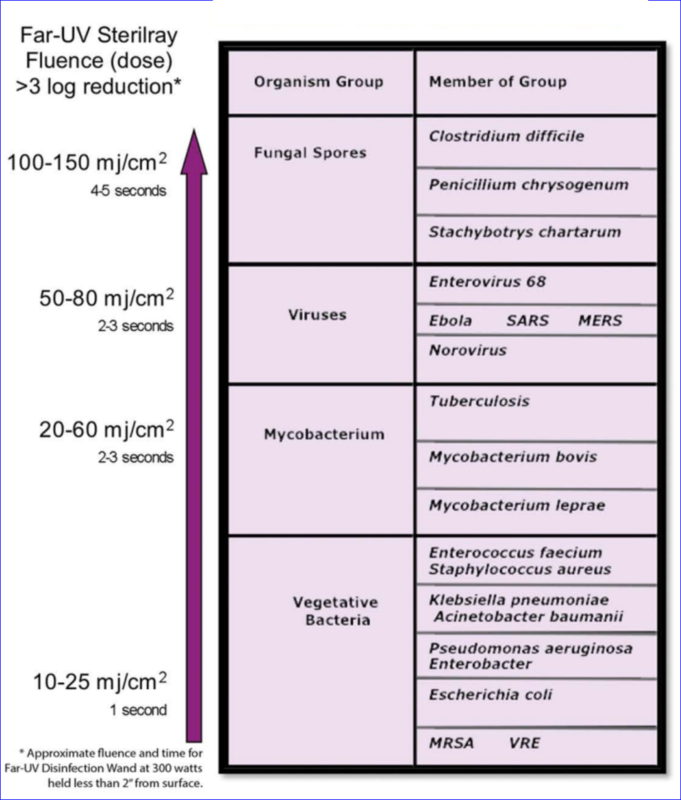 Level of disinfection proportional to run time; 7 hours produces >6 log kill on floor level surfaces. Provides a high level of disinfection between room occupancy during the day and total disinfection each night. Uses Far-UV Sterilray™ that is being tested for safe use on skin as opposed to UVC which can cause erythema. Center of Room Ceiling Mount. Kills airborne microbes in <0 . 2 seconds of exposure. Kills any microbes on exposed surfaces in the room facing towards the ASDU. Reduces installation costs: ONE unit per OR is sufficient. Comfort in knowing that pathogen removal has occurred in a convenient process 365 days/year. Increased confidence that germs are being reduced proactively whenever the ASDU is in use. Quick, high-level disinfection of room air and all exposed objects with the flick of a switch. Can be used each night for maximum disinfection or during the day to achieve a high level of disinfection between room occupation. Reduces HAl’s and SSI’s cases saving cost associated with patient care expenses. Supports a comprehensive decontamination approach and improves or complements existing manual application methods for cleaning. Critical care rooms that need routine but assurance of high-level disinfection of air and surfaces. Critical care rooms used with contact patients. Any health care rooms that need assurance of a very high level of disinfection of microorganisms between each day’s use. 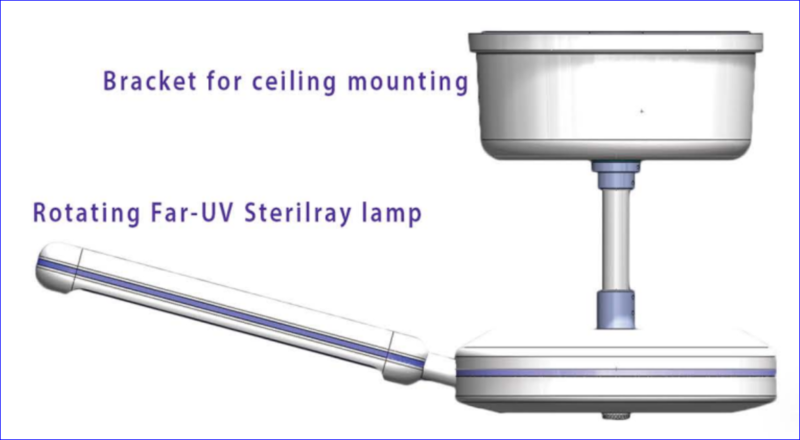 While not meant to replace existing cleaning protocols, ceiling-mounted Sterilray’s ASDU devices can help support a comprehensive decontamination approach and improve or complement existing manual application methods for cleaning and disinfection. 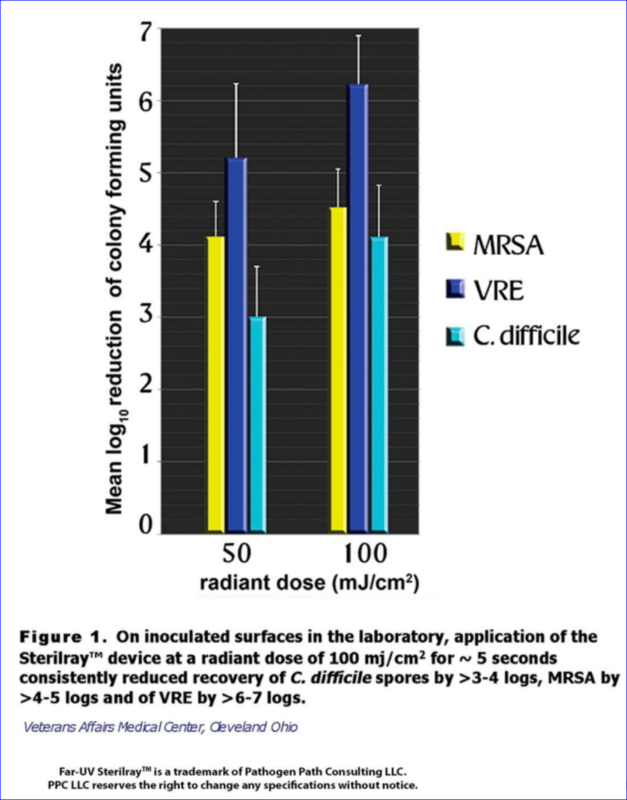 Recent studies suggest that FAR·UV Sterilray™ disinfection may be more effective when used after traditional cleaning protocols. Therefore, cleaning must remain an important part of terminal room disinfection.